Gloucestershire’s Kevin O’Brien sensationally smashed his way to the fastest hundred of the season with a 44-baller against Middlesex at Uxbridge on June 26 to take pole position in the chase for this year’s Walter Lawrence Trophy, supported by Veuve Clicquot. 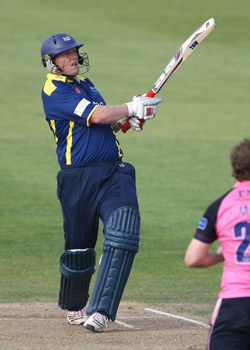 Amazingly, his opening partner Hamish Marshall also hit a scorching ton, off 53 balls, to take second spot as the pair tore up the record books in the Friends Life t20 South Group match. They put on an awesome opening stand of 192, the highest partnership for any wicket in domestic T20 cricket; Gloucestershire became the first side to boast two centuries in the same T20 innings, and the side’s total of 254 for 3 is the highest in domestic T20 matches and was only 4 runs away from equalling the world record. The Middlesex attack was taken apart as O’Brien, reminding us of his pulsating 50-ball century in the World Cup for Ireland against England, thumped 9 sixes and 7 fours in his hundred, while his New Zealand partner, Marshall, hit 4 sixes and 11 fours in his. The battle for this year’s Walter Lawrence Trophy award for the highest-scoring batsman from the six MCC Universities reached epic proportions as Durham’s Chris Jones recorded a monumental 252 not out in the MCCU Championship match against Oxford at The Parks on April 22 to win. Scored off just 271 balls, Jones’ unbeaten 252 included 40 fours and one six and is the highest score recorded since the Walter Lawrence Trophy award was introduced in 2006. Jones is the sixth recipient of the award since its inception and is the first Durham player to win it. He will receive a silver medallion and prize of £1,000 at the end-of-season dinner in The Long Room at Lord’s, when the main trophy, for the fastest hundred in terms of balls faced, is presented.